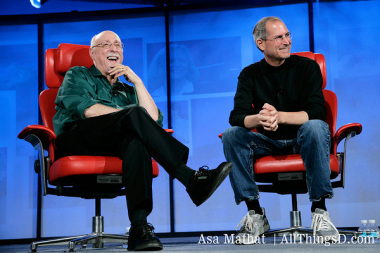 AllThingsD marks the anniversary of Steve Jobs’s death with Walt Mossberg’s memories of the man, originally published Oct. 5, 2011. That Steve Jobs was a genius, a giant influence on multiple industries and billions of lives, has been written many times since he retired as Apple’s CEO in August. He was a historical figure on the scale of a Thomas Edison or a Henry Ford, and set the mold for many other corporate leaders in many other industries. As he liked to say, he lived at the intersection of technology and liberal arts. But there was a more personal side of Steve Jobs, of course, and I was fortunate enough to see a bit of it, because I spent hours in conversation with him, over the 14 years he ran Apple. Since I am a product reviewer, and not a news reporter charged with covering the company’s business, he felt a bit more comfortable talking to me about things he might not have said to most other journalists. Even in his death, I won’t violate the privacy of those conversations. But here are a few stories that illustrate the man as I knew him. I never knew Steve when he was first at Apple. I wasn’t covering technology then. And I only met him once, briefly, between his stints at the company. But, within days of his return, in 1997, he began calling my house, on Sunday nights, for four or five straight weekends. As a veteran reporter, I understood that part of this was an attempt to flatter me, to get me on the side of a teetering company whose products I had once recommended, but had, more recently, advised readers to avoid. Yet there was more to the calls than that. They turned into marathon, 90-minute, wide-ranging, off-the-record discussions that revealed to me the stunning breadth of the man. One minute he’d be talking about sweeping ideas for the digital revolution. The next about why Apple’s current products were awful, and how a color, or angle, or curve, or icon was embarrassing. After the second such call, my wife became annoyed at the intrusion he was making in our weekend. I didn’t. Later, he’d sometimes call to complain about some reviews, or parts of reviews — though, in truth, I felt very comfortable recommending most of his products for the average, non-techie consumers at whom I aim my columns. (That may have been because they were his target, too.) I knew he would be complaining because he’d start every call by saying “Hi, Walt. I’m not calling to complain about today’s column, but I have some comments, if that’s okay.” I usually disagreed with his comments, but that was okay, too. Sometimes, not always, he’d invite me in to see certain big products before he unveiled them to the world. He may have done the same with other journalists. We’d meet in a giant boardroom, with just a few of his aides present, and he’d insist — even in private — on covering the new gadgets with cloths and then uncovering them like the showman he was, a gleam in his eye and passion in his voice. We’d then often sit down for a long, long discussion of the present, the future, and general industry gossip. To my knowledge, the only tech conference Steve Jobs regularly appeared at, the only event he didn’t somehow control, was our D: All Things Digital conference, where he appeared repeatedly for unrehearsed, onstage interviews. We had one rule that really bothered him: We never allowed slides, which were his main presentation tool. One year, about an hour before his appearance, I was informed that he was backstage preparing dozens of slides, even though I had reminded him a week earlier of the no-slides policy. I asked two of his top aides to tell him he couldn’t use the slides, but they each said they couldn’t do it, that I had to. So, I went backstage and told him the slides were out. Famously prickly, he could have stormed out, refused to go on. And he did try to argue with me. But, when I insisted, he just said “Okay.” And he went on stage without them, and was, as usual, the audience’s favorite speaker. Steve Jobs didn’t die that day, to my everlasting relief. But now he really is gone, much too young, and it is the world’s loss.